Three is a pretty exciting age for children. Given the rapid cognitive and behavioral development, it’s important to keep them engaged with interesting indoor activities for 3-year-olds. This is very important in developing their skills and will also enhance their learning, cognitive, and motor areas. This is when they are entering preschool, and you’re likely to see some rapid changes in their behavior. It’s particularly important that parents help their child adjust to the new experiences that come with this age. Your child may show signs of aggression as they interact with other children as well. Other notable changes include rapid language development. The average three-year-old is very curious, so you’ll be getting a lot of questions about why something is the way it is. Of course, finding indoor activities for 3-year-olds can be harder than you think. You need to come up with things that are fun, creative, imaginative, and most importantly, educational. Here’s a list of 11 creative indoor activities for 3-year-olds that can help you get started. This indoor activity for 3-year-olds is a lot of fun. It might turn your house upside down for a bit, but it’s a great way to help develop your child’s motor skills. You can set up an obstacle course where your child has to jump over a couple of cushions, then crawl over chairs and under the table, jump on a doormat, and then climb on the bed. It will put their energy to good use, and will also help improve their physical strength and flexibility. Storytelling sessions work well as a family activity. Some of the biggest benefits include improving your child’s vocabulary and pronunciation. It’s also great for their imagination, and of course, it’s a great way to just spend some time together at the end of a long day. When it comes to indoor activities for 3-year-olds, dabbling in arts and crafts is a must. You can try finger painting, or get a little creative and try painting with forks. Painting helps develop a child’s imagination. It’s also great for visual development and helps familiarize them with colors. It can improve the observational powers of a child too if they are taking inspiration from real life. Besides painting on paper, you can also try painting pots with your child. Not all scavenger hunts need to involve collecting things. 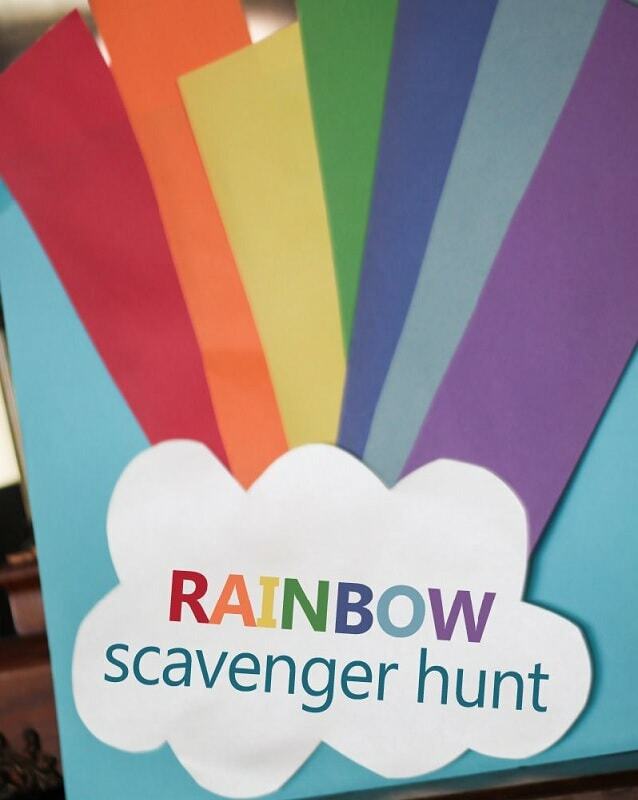 You can also plan a scavenger hunt where your child has to identify all the colors in a rainbow. This indoor game for 3-year-olds is especially useful for their visual development; it will also require them to be physically active. A color-based scavenger hunt can also help develop their cognitive learning skills. It can also help your child develop attention to detail and memorize all the colors found in a rainbow. This is pretty common among the list of indoor activities that parents can try for their 3-year-old toddlers, and for a good reason. You can start your kid off with basic shapes and let them experiment. The colorful-looking dough is even more exciting, so make sure you get some in different colors. Besides being fun, this activity is great for a child’s sensory development as well. It improves their motor skills and develops their tactile sense. Puzzles are a great indoor activity for 3-year-old children. They can help improve your child’s motor skills, spatial skills, and develop their cognitive learning processes. Puzzles make children better at problem-solving as well. They also improve their hand-eye coordination. Managing to solve puzzles is great for their self-esteem too. You can also introduce your child to Lego. It’s a lot of fun and can really help in their development as well. For instance, playing with Lego can really improve your child’s patience. It helps their organizational skills and allows them to focus better. Lego also aids in developing a child’s motor skills and increasing their spatial awareness and is great for constructive problem-solving. When playing in a group, it can improve their communication and help them learn about teamwork. You can download different sounds on your phone and teach your child about them. Common sounds include animals, thunder, rain, and transport. This will help develop their auditory senses. You can also teach your child about various kinds of smells. Set up a collection of fruits and flowers and introduce your child to these fragrances. This is great for their olfactory senses. SpongeBob made a pretty good point with this one. Playing in a box can do wonders for your child’s imagination. It provides them with a creative space where they can be whoever they want. This indoor sport for 3-year-olds is great for their cognitive skills and helps pass the time in a fun way. Even at the age of three, your child is likely to have a favorite profession. You can buy them a kit for this and let your child pretend they are working. It’s a fun activity and also provides your child with some exposure regarding the work involved in these professions. If you have some tin foil to spare, then you can turn it into a work of art. You can get your child to draw patterns across the foil, then twist and fold it to make shapes. This indoor activity for 3-year-old kids is fun and can also improve their imagination and creativity.